The best city builders feel like well-populated ant farms, CPU cores and AI code driving the routines of dozens of people-specks as they go from home to work to bed. Half the fun of SimCity, for all of its issues, is the way its tilt-shifted dioramas become blurs of activity, whirring machines that produce money and pollution and crime and college educations. Banished , a more recent entry, includes a time-lapse tool so that you can chart the slow progress (or starvation-driven decline) of your community. Clockwork Empires , too, gives you that space to simply watch . Looking over the game—the first time anyone outside of Gaslamp Games has seen it—I see neatly-stacked bricks waiting to be laid. Lumps of bread. Farmers tugging at the soil with hoes. Carpenters knocking hammers against wood. A miner chipping away at a block of sulfur. Foragers marching antlike in column formation, ferrying black cap mushrooms back to base for pickling. Heat leaking through a kiln grille as pottery bakes inside. And an explorer, hauling back a strange artifact they found in the wilderness, then founding a cult dedicated to worshipping it in your settlement. Cursed artifacts aren't the only threats. Life on the frontier is inherently tough—sometimes it's simply old-fashioned cannibalism that you have to contend with. During my visit to Gaslamp Games in Vancouver, Technical Director Nicholas Vining tells me how his citizens turned to eating one another in his most recent settlement. “I made the mistake of making opium instead of cabbage,” he admits. As a result, when fishpeople attacked his settlement, his colonists were too busy hauling the plant from farm plots to stockpiles to properly defend themselves. Many civilians died. The fishpeople were eventually slain, but when the surviving settlers got hungry, their AI told them to butcher and eat what was available: corpses of fishpeople and normal people. “Cannibalism was often a part of frontier life,” footnotes Daniel Jacobsen, Gaslamp's CEO. Vining elaborates further: “Archaeologists discovered there are gravesites where they would bury their dead, and then after they had a Christian funeral, they'd dig them up and eat them.” Gaslamp later points me to some grisly forensic analysis of the Jamestown colony. 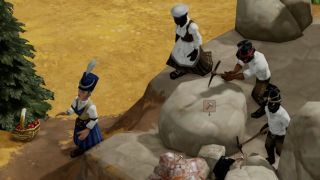 Despite being a game that features sea serpents, historical authenticity has some bearing on the design of Clockwork Empires, a value that extends even to the way that citizens get drunk. After the incident, morale in Vining's settlement was low “due to cannibalism and fishpeople and death,” he says, so he went to work building a brewery. Alcohol, at a code level, makes characters temporarily forget their emotional state. If a colonist gets sad, scared, or, say, enters shock from seeing their spouse mauled by fishpeople, drinking might be one way they choose to deal with it. There will be other, less self-destructive coping behaviors, too, although “becoming an axe murderer” is another, I'm later told.